Tonight I made this recipe that is tasty, filling and easier to make than it looks. Feel free to play around with it a bit and substitute other vegetables or switch out the quinoa for another grain, such as brown rice. This recipe serves two. Add 1 C. water to quinoa in a small saucepan and bring to boil. Cover and simmer until water is absorbed - 5 to 10 minutes. Preheat oven to 375 degrees. 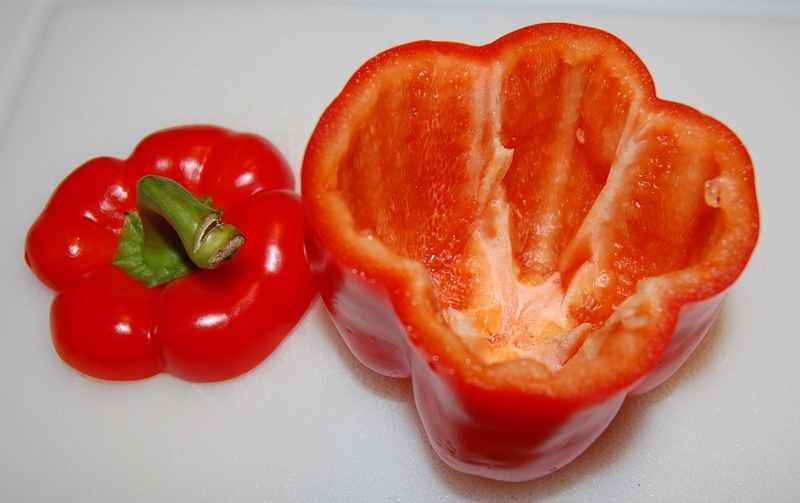 Meanwhile, slice top off of red pepper and remove seeds and membranes. Heat olive oil in skillet on medium high. Add onion and sautée until translucent. Add garlic, corn and spinach. Season with basil, oregano and salt and pepper to taste. Sautée 1 to 2 minutes. Remove from heat and stir in quinoa and then cheese. Fill peppers with quinoa/veggie mixture and replace their tops. Bake in shallow baking dish (uncovered) for 20 minutes. Jinxy, your vegetables look so vibrant and colorful; I bet this meal was delicious. I love stuffed peppers, and you remind me I haven't had them in a couple months. I love quinoa! This looks delicious. Thank you so much for linking this up! This looks delicious! I'm so glad you saw me tweet - it looks like we have similar interests! I'll be back!